Thanksgiving is coming and so are the in-laws. And if you’re like me then there’s nothing you’d like more than to upstage your sister-in-law’s over-the-top Thanksgiving dinner from last year. So what if she hired an upscale caterer and home decor specialist named Claude. You’re armed with a Pinterest board and some serious DIY skills. With a mouth-watering menu planned, it’s time to tackle the table. First, you’ll need to decide on a style that suits your home. Check out my short list of styles for dressing your table: traditional, modern, whimsical and outdoorsy. 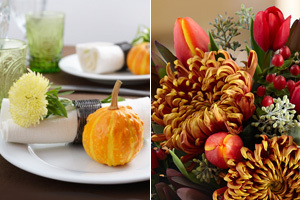 For this quintessential Thanksgiving table setting you’ll use a warm color palette with varying hues of brown, orange and green. 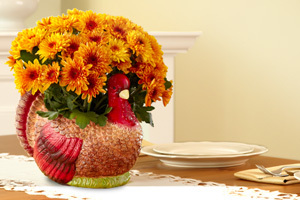 Start with a Thanksgiving centerpiece that evokes timeless holiday traditions like a turkey centerpiece with seasonal mums. Follow with festive touches like hollowed out mini pumpkins with tea lights. 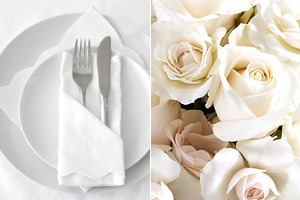 White on white might be the simplest way to set an elegant table. Use all white dinnerware and serving dishes. Add personality with eye-catching white patterns on napkins, placemats, chair covers and name cards. Create multiple small centerpieces with clusters of white bud vases and white flowers such as roses, Anastasia mums and snapdragons. Create continuity in this chic, undone look by sticking to a set of colors – such as gold, teal and pink. Then go wild. Mix and match vintage dishware. Create hand-painted chevron placemats. 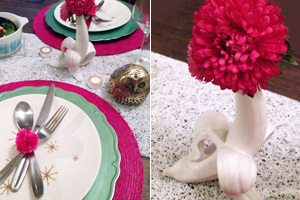 Use bright blooms in quirky vases or vintage animal figurines as table accents. Personal touches give this table its eccentric vibe. Blow the roof off your dinner (literally) by taking it outside. Let nature be your backdrop as you transform your backyard into a festive dining area. Pick moss and place along the center of the table with bouquets set in mason jars. Fabric covered picnic tables with simple place settings add charm to this rustic setting. Give these ideas a try and you’ll wow the family before the first bite hits the fork. Take that sis.